The arrival of the RTX 2060 wasn’t the only trick Nvidia had up their sleeve at this year’s CES conference, as they also announced a couple of interesting changes to their adaptive refresh rate G-Sync tech for gaming monitors. Chief among them was a new driver update for a select group of non-G-Sync screens that will effectively render them just as good as your official G-Sync displays without the extra price tag, plus a re-branding of their high-end G-Sync HDR and BFGD (or ‘big format gaming displays’, to you and me) monitors. Nvidia, you have my attention. Let’s start with the rebrand first. Previously, Nvidia graphics card-friendly monitors fell into two main camps: regular G-Sync screens and G-Sync HDR monitors. The latter did all the same things that ordinary G-Sync monitors do like eliminating screen tearing and stutter, but with HDR support added on top. Screens like the ludicrously expensive Acer Predator X27 and Asus ROG Swift PG27UQ. There were also Nvidia’s BFGD (or big format gaming displays) to take into account as well, which were also G-Sync HDR enabled but absolutely massive in size, measuring 65in across the diagonal and more akin to a TV than something you’d put on your desk. But all those various subcategories and brand distinctions are no more. G-Sync is still alive and kicking, but G-Sync HDR and those BFGDs have now been rolled into the single moniker of G-Sync Ultimate. Personally, I always thought the HDR suffix was fairly clear, but at least no one has the burden of saying ‘Big Format Gaming Display’ any more, because let’s face it, it’s a terrible name and no one ever really knew what it actually meant. I should also note that the HP Omen X 65 BFGD has alsoo undergone another refresh, this time under the new name of the HP Omen X Emporium 65 (as you may have spotted in the header image at the top) sans sound bar – although an Nvidia representative has since told me that there will likely be two versions available whenever HP decide to launch it, one with and one without said sound bar. After all, if you’re spending goodness knows how much on a 65in monitor, you’ve probably got your own flash sound system to hook it up to. What really caught my eye in the world of Nvidia-flavoured monitors, however, was the announcement of a new driver update coming on January 15th for a small bunch of existing ‘adaptive sync’ monitors (that is, AMD FreeSync screens because they’re one and the same as adaptive sync screens), that will effectively turn them into proper, honest to goodness G-Sync ones. This is good news for anyone who’s got an Nvidia graphics card but are currently slumming it with an incompatible FreeSync screen because they’ve been put off by high G-Sync prices, as it effectively means you’ll be able to benefit from all the lovely advantages of G-Sync without crippling your gaming budget. After all, if you’ve ever tried using a FreeSync screen with an Nvidia graphics card, you’ve probably found they’re not the best of friends – hence why my best gaming monitor has so many difference categories. If you’re not suffering from the odd crop of black frames every now and again, you may have experienced a weird, pulsing-like sensation onscreen that clearly isn’t meant to be there. 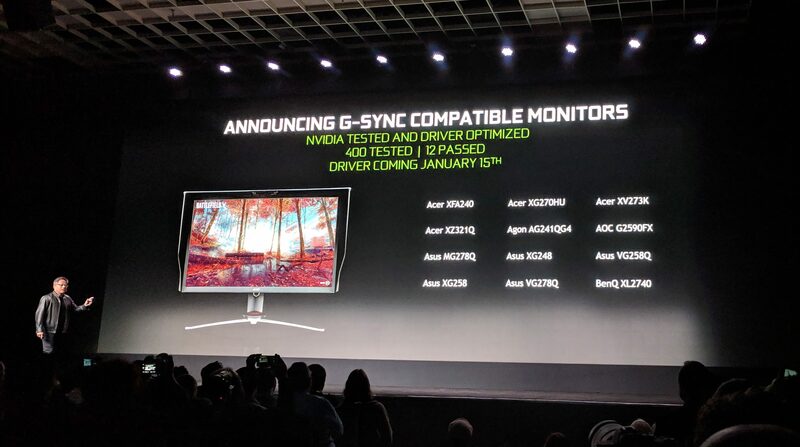 However, it would seem Nvidia have finally woken up to the fact that not everyone likes paying an extra wodge of cash for the privilege of having a G-Sync-enabled monitor compared to their infinitely cheaper FreeSync counterparts, so they decided to undertake the noble task of testing every single recent FreeSync monitor in existence (all 550+ of them, apparently) to see which ones might actually be up to snuff as a potential G-Sync candidate. Dubbed ‘G-Sync Compatible monitors‘, these gaming displays will be certified by Nvidia as being able to produce an experience akin to buying a proper G-Sync monitor. Nvidia didn’t go into details about exactly what ‘G-Sync Compatible’ means compared to the full-fat specification (that is, whether they’ll be missing certain features or whether they’ll support the full whack of low input lag and ultra low motion blur etc), but I’ll update this article with more information as soon as I have it. In the mean time, it’s sort of good news for some FreeSync monitor owners out there, as you might be due a nice little upgrade that will cost you absolutely nothing. For more news and hands on previews from this year's CES, check out our CES 2019 tag. Tagged with G-Sync, Hardware, Monitors, Nvidia, Nvidia Big Format Gaming Displays, Nvidia G-Sync, Nvidia G-Sync HDR, Nvidia G-Sync Ultimate.